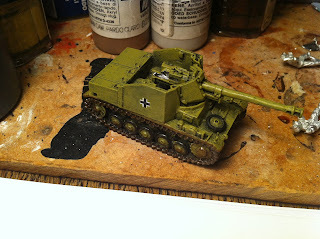 People's Champ Wargaming Blog: Test FJ Marder - Feedback? Well vehicles don't take as longs as infantry stands thats for sure. This is a test to see how it turns out. Not sure on the tracks. I tried to make them look worn and muddy but not sure if it looks okay. Probably need a highlight on the edge of the armour plus I have a couple of crew to do.